*looks at the problem again to read & copy the solution* = 6 ….. !!! ONE PROBLEM DOWN! This process was repeated for 131 times and it took forever. But why am I bringing this up? Because of that process- reading a problem out loud and copying it, I was studying before I knew what studying was! And because 7-year-old Irma was a good student and listened, I know my multiplication tables well. I acknowledge this isn’t a major accomplishment for a college sophomore, but hey, for a second-grader, I was ahead of the game! Speaking of games (see how I just slipped that in there) in Making Camp, we have an activity where you can test your knowledge. Your job is to match the problem with the solution. How well do you know your multiplication tables? 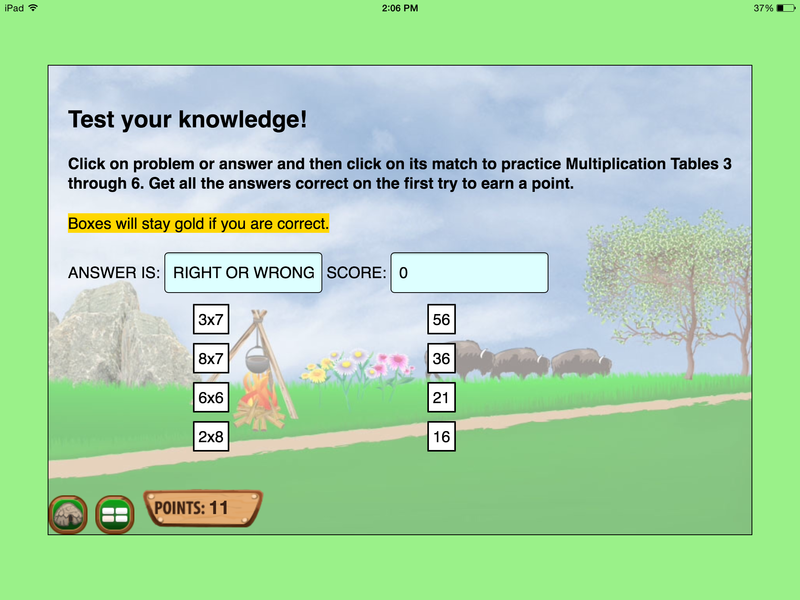 This is great practice for students learning their multiplication tables! When I was 7, I saw it as burden- boring and memorizing. In Making Camp, children forget that they are practicing math because they are earning points they can spend to buy stuff for their wigwam. If you are young enough to remember Club Penguin,you know how addicting that is for a kid. Also, a bit of my childhood has gone, because Club Penguin shut down in March. Because let’s face it, math class wasn’t always our favorite class, especially if we had no idea what equals 3 x 7. Making Camp allows children to improve their math skills and have fun! So, yes, this 19-year-old plays Making Camp to exercise my brain. But hey, these games make me smarter, so why not invest some time into it! You should see how good my wigwam looks. Did I mention Making Camp is FREE! Go download it today!